Don’t know what to do with your old magazines? 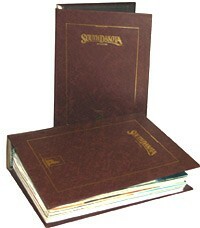 Our handsome vinyl binders hold two years (12 issues) of South Dakota Magazine. Personalized with our logo, these binders add beauty to your library or coffee table, while preserving South Dakota's leading magazine. 12 in. tall x 8.75 in. wide x 3.5 in. thick.